Thoughts and applications for marketers. Last week, I polled the masses (Ha! I wish.) regarding what to write about for this week’s blog post. The response: social media in the 2012 presidential race. So without further ado, here’s the winning topic. In 2008 we saw how effective social media can be in a presidential election. President Obama and his team were able to capitalize on the extensive reach social media offers, as well as the rapid viral spread of messaging in the social space, and turn that buzz into votes. 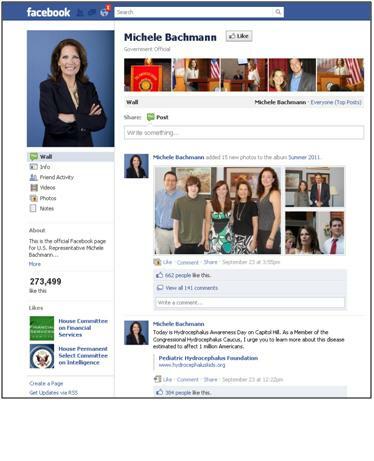 Michele Bachmann’s campaign does have a social media presence, but on the day she announced her presidency, her social sites were quiet. Not a good start social media wise. This would have been the perfect time to engage voters in social channels as the announcement prompts an increase in site visits. But, Bachmann continues to keep voters informed of her recent actions in Congress and policy views via social media, and she’s making a grassroots effort to encourage small donations. This potentially includes a strategic plan to re-engage these donors later on for additional funding since they haven’t exceeded the $2,500 donation cap. President Obama’s last campaign had a grassroots focus. This time it appears the Obama campaign will institute a more traditional run with increased TV ad spending along with engaging voters in social channels. 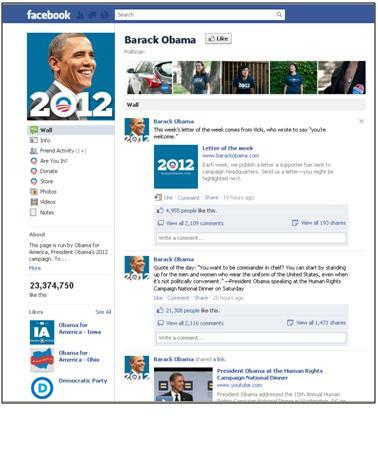 Obama did announce his re-election campaign via Facebook and Twitter and hosted a Facebook Town Hall Meeting in April. New this time around is the fact that Obama will actually be tweeting via his Twitter account. Tweets are annotated with a “-BO” designation. *Candidates were chosen based on the latest Gallup recognition poll and must have declared a run for the 2012 presidential race.